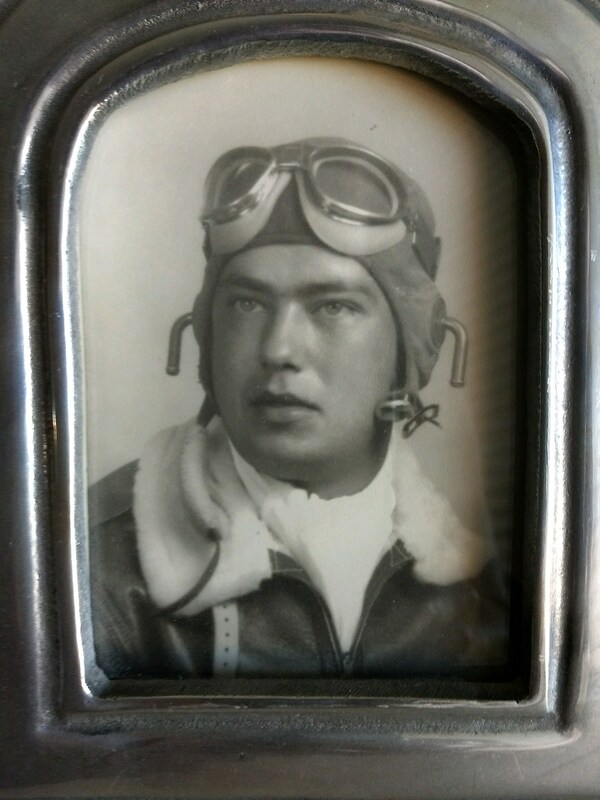 A pilot remembered… Pictured here in his flight gear is First Lt. Frank A. Rush, who earned a medal during WWII that was misplaced for many years. Elmhurst resident Wally Luszczyk, who found the medal, has planned a special reception to present it to Rush’s daughter on Sunday, Nov. 25 from 1-3 p.m. at the Villa Park VFW Post #2801, 39 E. St. Charles Rd. Free and open to the public. Chalk it up to “it’s a small world,” or “the Good Lord works in mysterious ways,” or whatever makes serendipitous encounters occur, but it’s always nice when good things happen right in your own backyard – it’s even more meaningful when it is for someone who served in the U.S. Armed Forces. When it’s time to clean things out, that’s often when magical things happen. 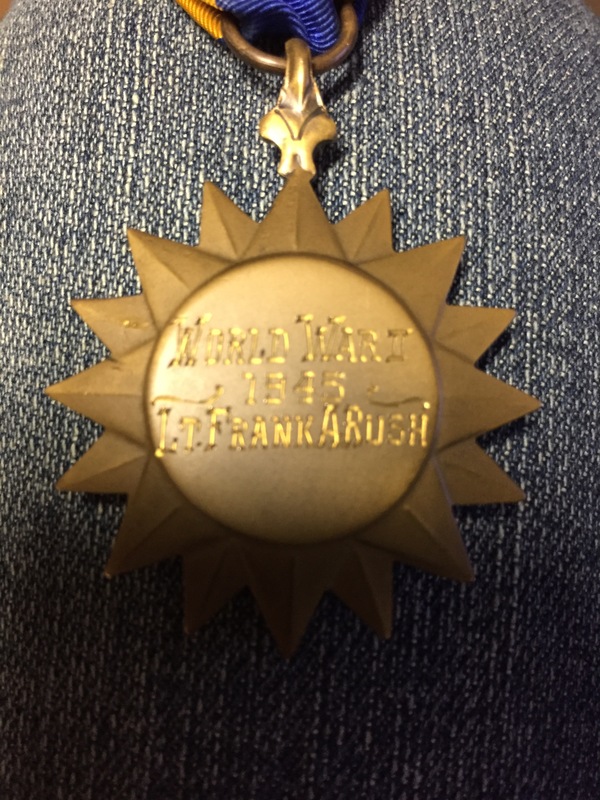 Sure enough, when Elmhurst resident Wally Luszczyk was going through his late father’s personal belongings, he ran across a WWII medal that apparently belonged to a man named Frank Rush – First Lieutenant Frank Rush, to be exact. That was the name on the back of the medal. Luszczyk was not even completely sure how his father came to own the medal. After an unsuccessful search on the Internet for a WWII soldier named Frank Rush, Luszczyk called Channel 7 news and reached a reporter named Jeff Marchese. It was Marchese who was able to track down Frank Rush’s daughter, Maureen Rush Brickman, who currently lives in Arizona. She was interested in obtaining her father’s medal, and as luck would have it, Maureen was scheduled to come to the Chicago area for a wedding in November. Luszczyk has set up a special event at the Villa Park VFW for this coming Sunday to present her with the medal. It’s difficult to read, but the back of this WWII medal is engraved: World War II – 1945 – Lt. Frank A. Rush. Lost for many years, but found by an Elmhurst resident, the medal will be returned to Lt. Rush’s daughter at a special ceremony on Sunday, Nov. 25 from 1-3 p.m. at the Villa Park VFW Post #2801, 39 E. St. Charles Rd. The event, which will include a Color Guard and 21-Gun Salute, is free and open to the public. According to Maureen, that her father’s medals had been used in a Veterans Day display at a local library or senior center, but had never been collected from the location because 1st Lt. Frank Rush passed away shortly thereafter. “The fact that one has been found is an amazing story in itself,” she said. A special ceremony has been arranged for Sunday, Nov. 25 from 1-3 p.m. at the Villa Park VFW Post #2801 at 39 E. St. Charles Road, where Luszczyk is a member. The public is invited to attend and watch this exchange of the medal, as it is presented to Rush’s daughter Maureen. Luszczyk has also arranged for a U.S. Marine Color Guard to perform a 21-gun salute. Maureen said her dad was a quiet man who rarely talked about the war, which seems to be the case with many who saw combat during WWII. Frank attended Quigley Prep in Chicago with plans to become a priest, but the war was on so he decided to enlist in the Army Air Corps in February of 1943. After basic training, Frank was a 1st Pilot on a B-17 bomber and served with the 8th Air Force based in England for nine months. He piloted the aircraft and commanded the crew during 30 combat missions totaling 250 combat hours. “While stationed in England his plans to become a priest took a U-turn,” Maureen said. “While riding a train to London, he chatted up a beautiful girl and the rest is history. He met my mother, Joyce Miles, and they were married in a few short months. Her father returned to the States and was discharged from Santa Ana Air Force Base in California, but her mother remained until passage could be arranged for British War Brides. She finally arrived in March of 1946 aboard The Queen Mary. They were married for 58 years. Frank passed away in 2003 at the age of 78, while Joyce died in 2016 at 91. “My father fell ill while visiting me in New Hampshire and died,” Maureen said. “I did not have his discharge papers to prove he was a veteran and was unable to obtain a flag in front of his obituary or purchase a memorial flag.